It was the result no one wanted to believe. Astronomers have observed what appeared to be a clump of dark matter left behind during a bizarre wreck following a collision between massive clusters of galaxies. The dark matter appears to have collected into a "dark core" while most of the galaxies seemed to have moved on, sailing past the collision site. This result could present a challenge to basic theories of dark matter, which predict that galaxies should be anchored to the invisible substance, even during the shock of a collision. The initial detection, made in 2007, was so unusual that astronomers shrugged them off as unreal because of the signal's moderate significance. The observational program that led to the 2007 discovery, the Canadian Cluster Comparison Project (CCCP), was conceived at University of Victoria and the first set of observations were carried out at the Canada-France-Hawaii Telescope. For Arif Babul of the University of Victoria, who co-led the CCCP, "the results were both intriguing and exciting but also engendered justified skepticism, the main criticism being that the clump of dark matter was an artifact of ground based observations, though we confirmed the CFHT results using observations from the Japanese Subaru telescope". However, new results from NASA's Hubble Space Telescope confirm that dark matter and galaxies parted ways in the gigantic merging galaxy cluster called Abell 520, located 2.4 billion light-years away. "Observations like those of Abell 520 are humbling in the sense that in spite of all the leaps and bounds in our understanding, every now and then, we are stopped cold," explained Babul, the team's senior theorist. A third possibility is that the core contained many galaxies, but they were too dim to be seen, even by Hubble. Those galaxies would have to have formed dramatically fewer stars than other normal galaxies. The Canada-France-Hawaii Telescope is a joint facility of National Research Council of Canada, Centre National de la Recherche Scientifique of France, and University of Hawaii. The image on top of the picture shows the distribution of dark matter, galaxies, and hot gas in the core of the merging galaxy cluster Abell 520, formed from a violent collision of massive galaxy clusters. it is a composite of the four images shwon below. The orange colored picture shows the starlight from galaxies, derived from observations by the Canada-France-Hawaii Telescope. 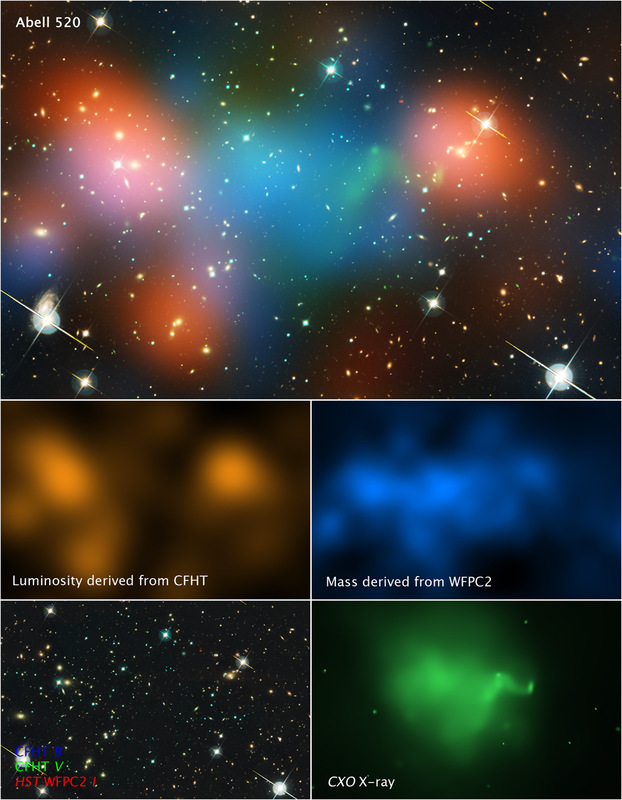 The blue colored picture pinpoints the location of most of the mass in the cluster, which is dominated by dark matter. Dark matter is an invisible substance that makes up most of the universe's mass. The dark-matter map was derived from the Hubble Wide Field Planetary Camera 2 observations, by detecting how light from distant objects is distorted by the cluster galaxies, an effect called gravitational lensing. The green-tinted picture shows regions of hot gas, as detected by NASA's Chandra X-ray Observatory. The gas is evidence that a collision took place. The ApJ Paper: A Study of the Dark Core in A520 with Hubble Space Telescope: The Mystery Deepens by M.J. Jee et al. is available here (pdf).